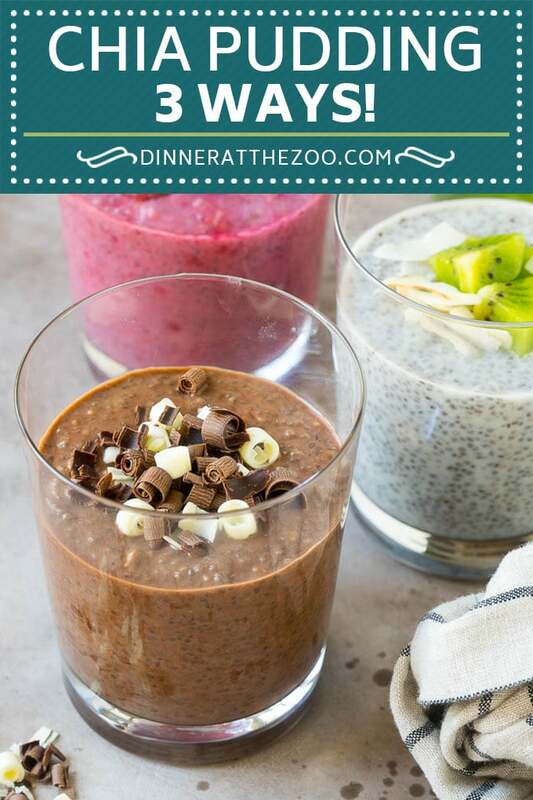 This chia pudding is a 3 ingredient meal or snack that’s vegan and full of nutrition. I’ve provided three different flavor variations for traditional, chocolate and raspberry chia seed puddings. 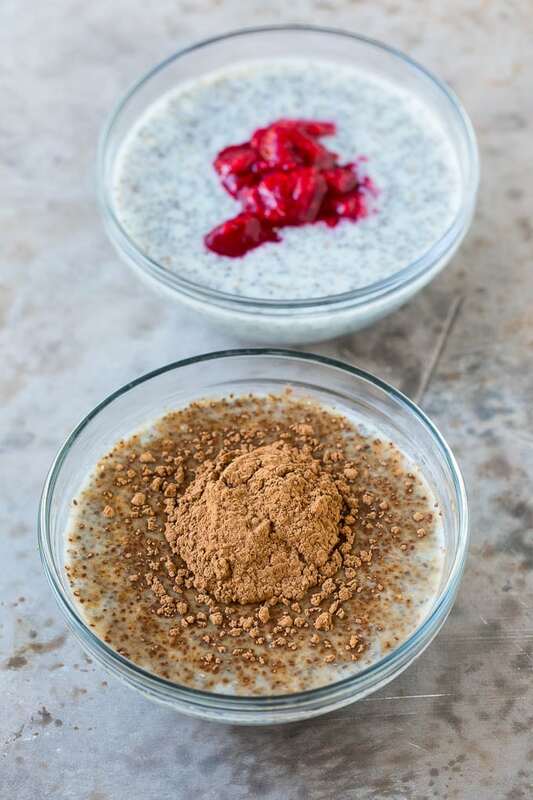 When I’m looking for a lighter snack, I turn to Mexican fruit cups, acai bowls and this easy chia seed pudding. It’s simple to make, kid friendly and packed with protein and fiber. When I’m looking for something on the sweeter side that won’t ruin my diet, I turn to chia pudding. It’s made with all natural ingredients, tastes delicious and can be whipped up in minutes. The hardest part is waiting for the pudding to set in the fridge! I’m sharing a basic recipe for this pudding, plus two ways to switch up the flavor. This recipe contains three basic ingredients: chia seeds, coconut milk and maple syrup. That’s it! The ingredients are mixed together, then the chia seed pudding goes into the fridge to set up. 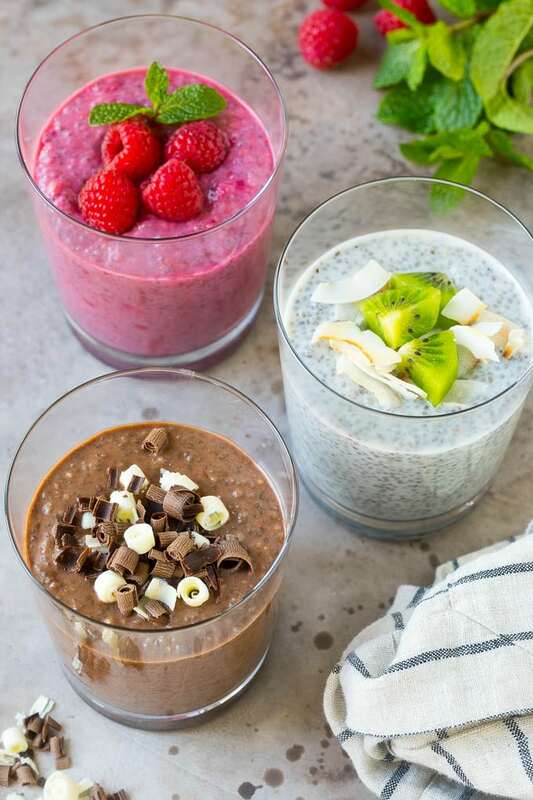 Typically it takes at least an hour for chia seed pudding to set up, so be sure to plan accordingly. My favorite way to make chia seed pudding is with coconut milk. That being said, if you prefer you can substitute 1 1/2 cups of dairy milk or almond milk instead. I use maple syrup as a sweetener to keep this all natural and vegan, but feel free to use other sweeteners such as brown sugar, honey, granulated sugar or agave. If you prefer a smooth textured pudding, you can actually put your pudding in a food processor or blender after it’s set up to puree the chia seeds. You can make pudding parfaits with layers of chia, fruit, nuts and granola. While I love plain chia seed pudding, sometimes I add cocoa powder to make a chocolate pudding or raspberries for a raspberry pudding. I’ve provided the measurements for these variations in the recipe below. 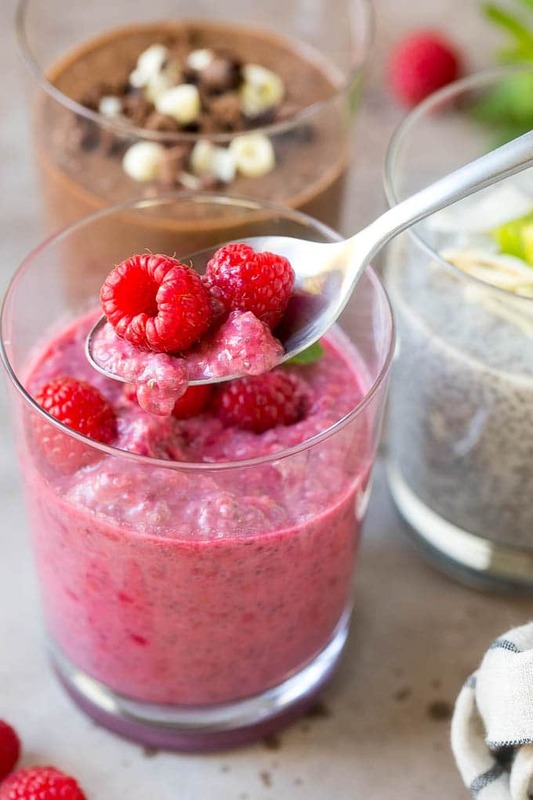 Is chia pudding good for you? Chia seeds are a great source of omega-3 fatty acids, fiber, protein, iron, calcium and antioxidants. They are a healthy addition to any diet! This pudding contains all the nutritional benefits of chia seeds, but it does contain some fat from the coconut milk and sugar from the maple syrup. 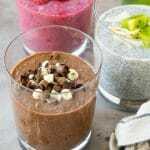 So while chia seed pudding contains nutrients, it’s like any other food where you’ll want to watch your portions to be sure that it fits into your daily caloric intake. 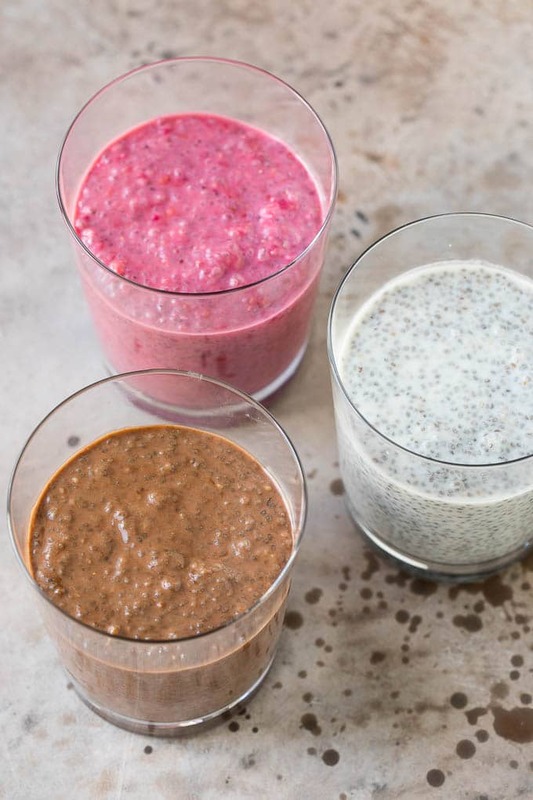 How long can you keep chia pudding in the fridge? 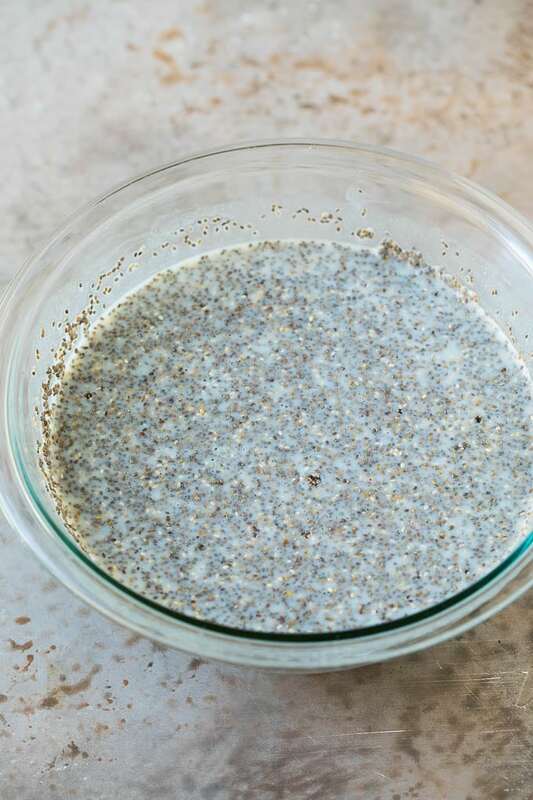 Chia seed pudding will last in the fridge for up to 4 days. You can store your pudding in a sealed airtight container for best results. You can also portion your pudding into individual servings for a quick grab and go breakfast or snack option. How do you thicken chia pudding? If you prefer your chia seed pudding to be super thick, you can simply add more chia seeds. I’d recommend adding an extra 2 tablespoons of chia seeds if you like a thick pudding. If you’re looking for a thinner pudding, you can stir more coconut milk in, one tablespoon at a time, until the desired consistency is reached. 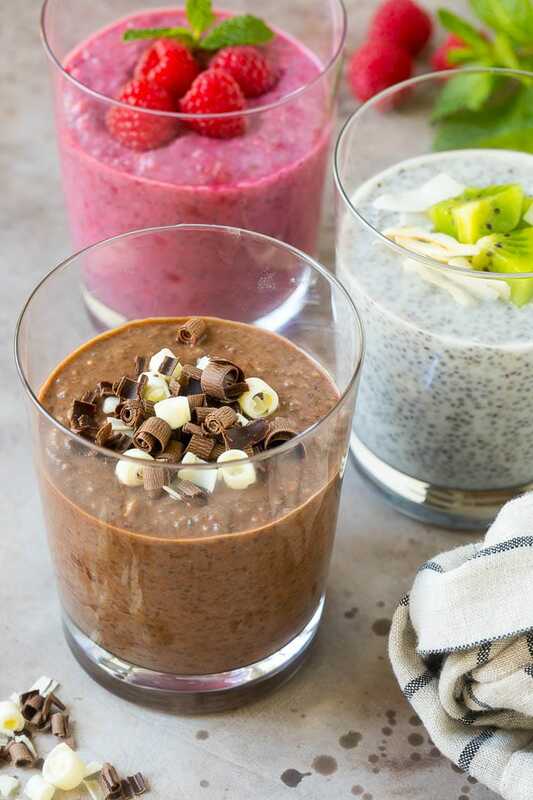 Can you freeze chia pudding? This pudding is a great candidate for the freezer. Simply freeze the pudding in small containers, then thaw it in the fridge for 6-8 hours before you’re ready to eat. 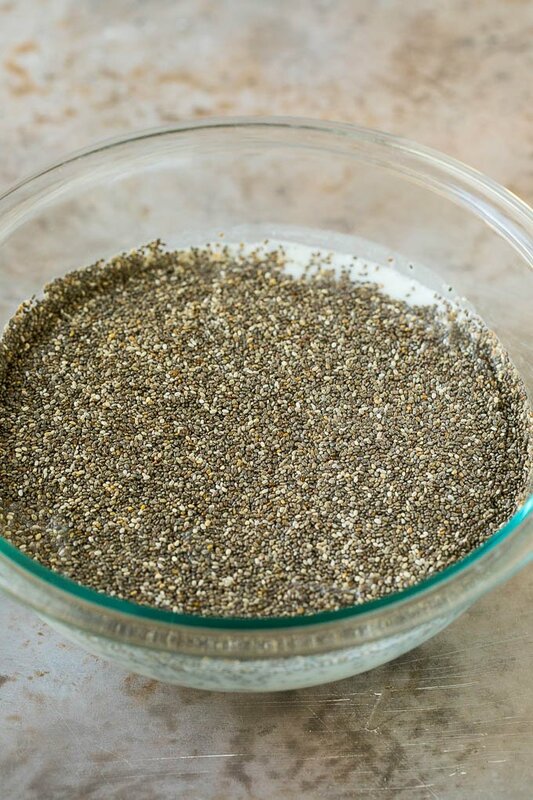 You can store chia seed pudding in the freezer for up to 2 months. Once you try this lighter treat, you’ll find yourself making it all the time! It’s great for a snack, breakfast or even dessert. This chia pudding is a 3 ingredient meal or snack that's vegan and full of nutrition. I've provided three different flavor variations for traditional, chocolate and raspberry chia puddings. In a large bowl, whisk together the coconut milk, chia seeds and maple syrup. Cover and chill for at least one hour or up to 3 days. For chocolate chia pudding: Add 1/4 cup cocoa powder to the coconut milk, chia seeds and maple syrup. For raspberry chia pudding: Add 3/4 cup smashed raspberries (thawed from frozen or fresh) to the coconut milk, chia seeds and maple syrup. I am an official ambassador for Dole Fresh Fruit and Fresh Vegetables. Dole provided me with compensation for my time. As always, all opinions expressed in this post are mine. This post was published on May 22, 2017 and was updated on March 26, 2019 with new content. 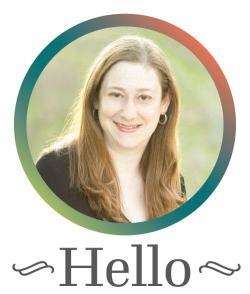 Thank you so much for sharing recipes with us. I hope I can make like you!!!!! I love chia seeds but ive always just put them in my water bottle and drank them. These are brilliant. Thanks for sharing. Yummy. I have never tried Chia pudding. You make it look absolutely nutritious and delightful! I just love everything about this! This is so good, this will be a huge hit! This would disappear in no time at our house! Ooh. I can’t wait to make this! pudding is one of my all-time favorite desserts, and I make every recipe I find. This one looks tasty!